So, you’ve been looking at your mailing stats diligently, exploring the Viewed, Engaged, Growth tabs… and Click Performance?! What is Click Performance? Excellent question, I’m glad you’re here. If you click on the “Stats” button on your dashboard, right underneath your promotion thumbnail, you can view the statistics for your latest mailing of that promotion. You’ll find a tab called “Click Performance”, at the bottom of all the other metrics that you can dive into. When you click on that tab, you’ll see a preview of your promotion, but it’s a little bit special. Wherever you had a clickable link in your sent promotion — hyperlinked text, image, etc. — you’ll see a little flag with a percentage in it. 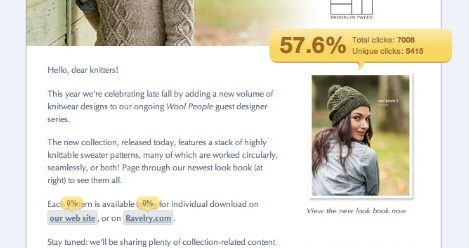 This flag tells you the percentage of your clicks that happened on that particular link. You can hover over each of those flags for more details — Mimi will show you the total clicks AND the unique clicks for just that link. You can see some other great examples of awesome click performance, right here. 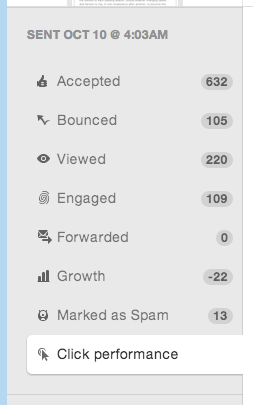 The Click Performance tab is only shown for individual mailings, and not for your overall, aggregated stats. If you want to view the stats page for any other of your mailings, simply click on the “SEE ALL SENDS” link, on the left of any stats page.